You finally finish your tax return, and a couple days later it hits you: Some vital piece of information slipped through the cracks. The panic sets in, fever dreams of IRS break-ins become a recurring nightmare, and you start moving canned food into your emergency bunker to wait out the storm. Of course, the IRS isn’t going to knock down your door, and you don’t have to resign yourself to canned ravioli for the foreseeable future; here’s what to do if you find a mistake after you’ve filed. What kind of mistake did you make? Do you even need to fix your tax return after you’ve filed? That depends on the type of mistake or missing information. 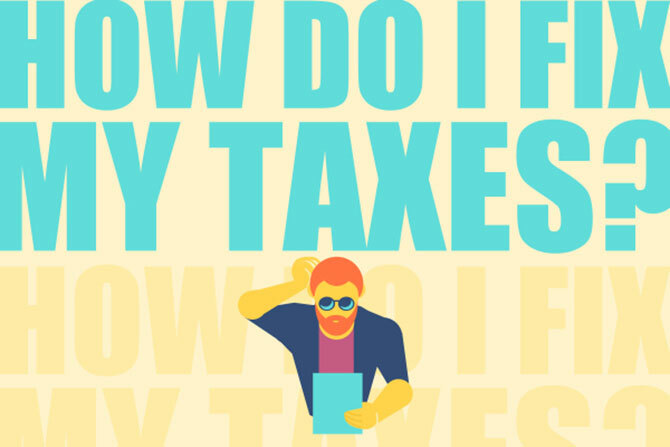 You should absolutely correct anything that has to do with your personal info, filing status, income amount and tax breaks; these are crucial to determining whether you owe money or get a refund, so they’re the most important. If you caught a math mistake, don’t sound the alarm just yet. The IRS will fix most math errors and send a notice by mail of any adjustments so you can confirm or question the changes. If you aren’t notified of the adjustment in 3 to 4 months, you should consider filing an amended return to ensure the IRS has an accurate return on file. An amended return is made up of two components: The corrected tax return and Form 1040X. The 1040X shows a comparison calculation to help the IRS easily identify the correction and compare with the previously filed return. For example, let’s say you’re a single mom who filed as single. After looking at your info, however, you discover that you actually qualify to file as head of household and get some sweet tax breaks. To fix your information, you would change your filing status to head of household, complete Form 1040X, review the differences, and print out the forms. Note: If your amended return increased your tax liability, you will need to send in payment—you can find this amount on Form 1040X. Once that’s finished, mail your amended return (and, if necessary, payment) and give it up to 16 weeks to process. Unfortunately, you can’t e-file an amended return: Snail mail is the only way to go. Sometimes an action plan helps better than a long explanation—so why not include both? Pinpoint the error on the tax return you’ve already filed. What kind of error is it? If it’s a math error, wait. The IRS will probably catch it. If it’s an error that affects your personal information, filing status, income amount, or tax breaks, move to the next step. Use your tax program to fix and print the information with Form 1040X. 1040.com filers can log in, change the info, and print a copy of the new tax return. Make sure to fill out and print Form 1040X which helps the IRS know what changes you made (and it’s required). Mail the amended return and Form 1040X together to the IRS. You can find the address for your nearest Department of the Treasury on IRS.gov. 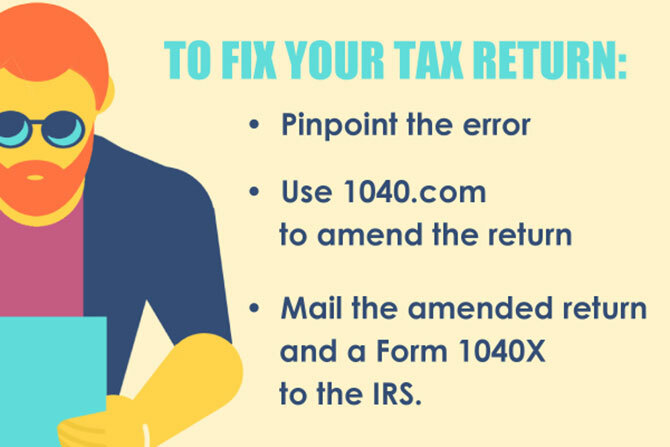 The good news is that, if you filed your first return with 1040.com, fixing and printing your new amended return is a breeze—just navigate to the section of the questionnaire that addresses the missing or incorrect info, make the appropriate updates with the new information, print it out and mail it in!